• with Certificate & Traceability : Controlled by Serial Number, Certificate, Delivery-information, and Traceable Data Base System. • 3-Side Heating Zone : The Best Temp. Uniformity & Accuracy by High Performance Heating Mechanism. • Optimized Air Flow by Gravity Convection Mechanism. • Digital Fuzzy Control System Implementing Superior Temperature Accuracy. * The Best Temp. Uniformity & Accuracy by High Performance Heating Mechanism : 3-Side Heating. * Optimized Air Flow by Forced Convection Mechanism. * Digital Fuzzy Control System Implementing Superior Temperature Accuracy. * New Jog-Dial with Push Button. * Compact New Body Design. * 2ea of Stainless steel Wire Shelves Included. * Alarm Function : Error status and Timer-end. * RS232C Interface for Monitoring and Controlling with PC. * Ambient +5℃ to 250℃ Range with Fluctuation of ±0.3℃ at 100℃. * Storage Function of Temperature and Timer setting values. * Locking Mode Supported for Experimental Safety (Input to Jog-Dial can be disabled). * Corrosion Resistant 304 Stainless steel Chamber. 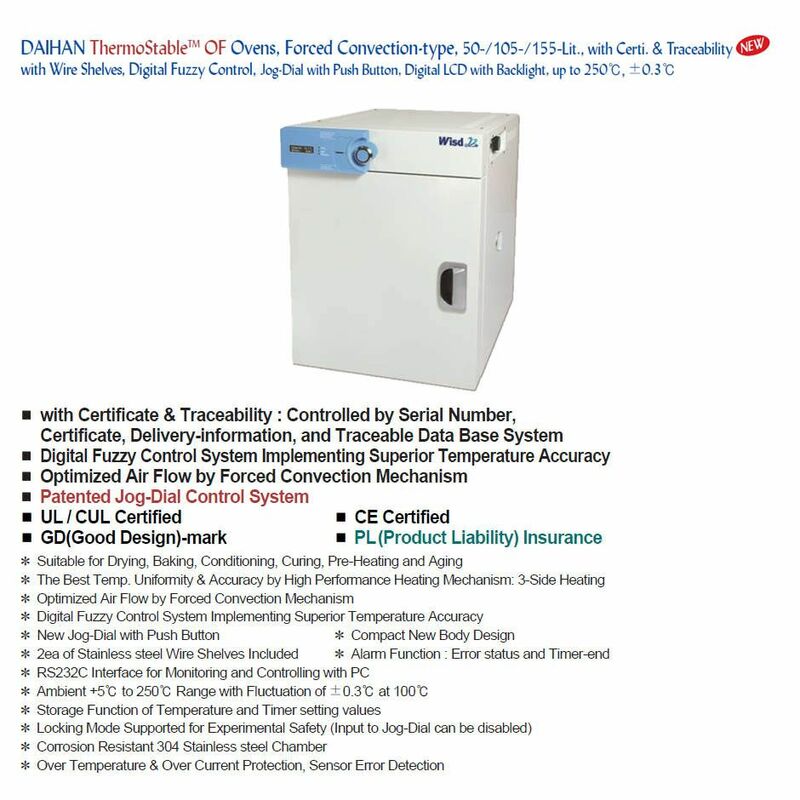 * Over Temperature & Over Current Protection, Sensor Error Detection.